dominated almost every town in England and Wales. The Motte (old French word for ‘clod of earth’) was a large conical mound. 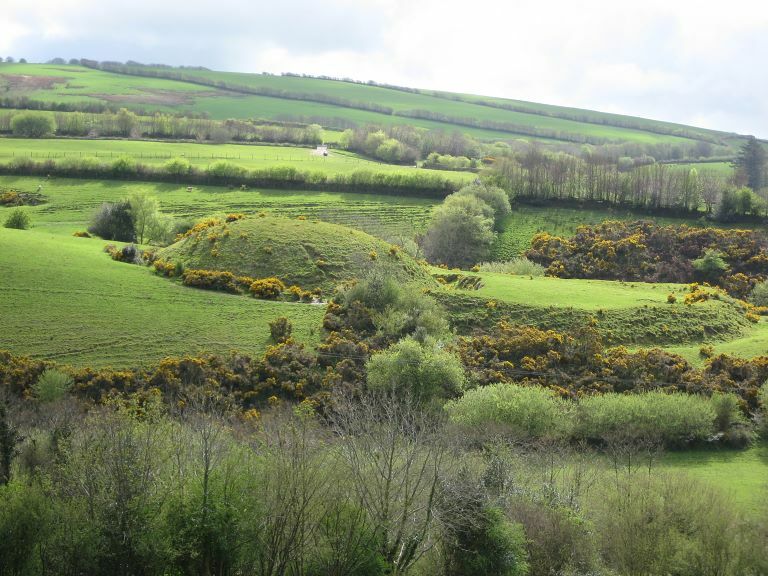 It’s possible that natural hillocks or outcrops were used, however most mottes were raised by digging around its sides and heaping the resulting soil up. Archaeological evidence has revealed that in some cases the Normans made use of demolished Saxon houses to raise the motte. The Bailey (meaning ‘enclosure’) was a simple ditch and bank enclosure, topped with a timber stockade and usually with the motte at one end. On top of the motte would have been a tower, called a keep, which formed the stronghold of the castle and the Bailey would have had timber structures such as a hall, stables, workshops and houses. The primary advantage of a Motte and Bailey Castle was that they were quick and cheap to erect which, given William’s initially tenuous grip on power, was important. It is estimated that the average castle would have taken eight to ten days to construct. The first castle that William built on landing at Pevensey in 1066 was actually topped by a prefabricated wooden structure brought across on the boats from Normandy. The Bayeaux Tapestry depicts the building of this first Motte and Bailey. Windsor Castle in Berkshire was originally a Norman Motte and Bailey castle and there are two others on Exmoor – at Bury and Dunster. Castle in England. There is no documentary evidence for Holwell Castle but it is known that at the time of the conquest the Manor of Parracombe was passed from Beorhtwald to William of Falaise. His land was part of the baronies of Blagdon and Stogursey. In the 13th c the Manor of Parracombe was held by William Fitzmartin of Blagdon. Holwell was probably built in the late 11th Century. The excellent preservation of Holwell means that traces of the keep are visible on top of the Motte as earthworks; also visible are the two towers where the Bailey ramparts meet the Motte ditch. On the western side of the motte a broad bank runs up the side of the Motte, this earthwork was the wing wall that contacted the Bailey tower to the Keep. At least six building platforms are visible inside the Bailey. To build it, the Normans would have had forced labour at their disposal but it is impossible to say where these people would have come from. There’s no evidence they were Parracombe residents. Holwell’s location is on a spur in the valley of the River Heddon and it is overlooked on all sides bar the north-west. This was not a defensive siting, it is a strategic and economic position. Just south of the river crossing and controlling the valley running down to the sea at Heddons Mouth, Holwell Castle is a symbol of power and dominance. Before the castle was built the population in Parracombe was in different areas: Churchtown, probably the earliest focus of population; Prisonford, which owes its name to the prison run by the St Aubin family in the medieval period and Bodley. Parracombe village probably formed because of the castle.